I think this would be the modern-day description of ‘accomplished’. If we fast forward Jane Austen to the twenty-first century, her characters wouldn’t be praised for their accomplishments but for knowing how do to things. Last week we had three visits from mi novio‘s younger sister (my cuñada), her older husband and nine-month old baby – all visits by virtue of the La Suegra staying with us – and on all occasions she said “Camille sabe hacer cosas.” (Camille knows how to do things). It only struck me the third time in a short period of time that she is in awe of what I do and I realised that almost every time she visits she says the same thing. She comments on little things that to me are the product of a little bit of curiosity or interest in something. On the third visit I was decorating La Suegra‘s birthday cake and accompanying cupcakes when they arrived, yet later when I opened the fridge to take out the giant cupcake and the other normal cupcakes, she asked in the most surprised voice if I’d made them myself and was I sure I hadn’t bought them. She then went on to say I should open a cake shop, a comment which her husband seconded heartily. I should note that I used a packet cake mix and the decorations were not as I had hoped because I messed up the ratio of cream to white chocolate so the ganache was runny and hardly stayed on the cake as I’d envisioned. I guess by Colombian standards, my cakes were pretty special because I made them myself. I don’t know any Colombian who bakes a birthday cake. Birthdays always mean a trip to the cake shop to buy an overly creamed cake. My other accomplishment, in the eyes of my cuñada, is the cross-stitch I am working on. While sitting around on the couch during these visits, in order to be at least partially social and keep my interest piqued in something, I have taken to working on my cross-stitch. 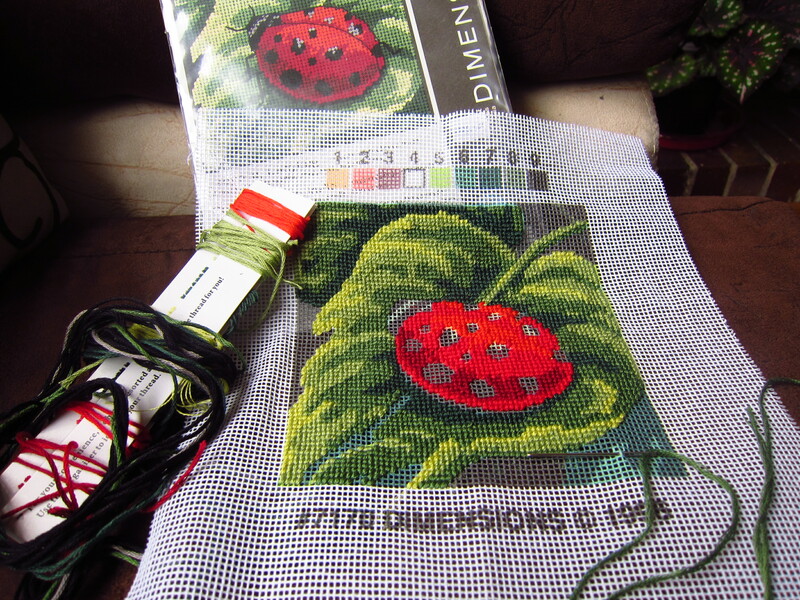 I hadn’t done any cross-stitch since high school, but recently the desire came over me, so I bought a little colour-coded kit of a ladybird to work on. Apparently knowing how to do cross-stitch is also something amazing, even though I’m just following the instructions and have ignored the suggested stitches for large areas because they look too complicated. What would also be amazing is if I knew how to knit, crochet and embroider, but alas, this fair maid knoweth not these feminine arts. I have always wanted to lead an interesting life, and I think that for my cuñada, my life has been like a fantastical latino soap opera that flirts with the borders of the possible. In contrast to her, I’m not content to sit and do nothing except watch soaps on TV. I like to explore, travel, learn new things, experiment, be creative, read, write, get crafty, visit museums and I like to work. To her, my inspired, but lacking in finesse, activities and crafts are the most amazing things. However, it’s all about exposure and experiences, and based on my experiences I admire and am awed by my friends who post elaborate and perfectly decorated cakes on Facebook, who produce the most darling little crochet and knitted pieces, who can sing or play a musical instrument, who can design and make their own clothes, who can take and edit incredible photographs, who envision and create films, who are disciplined and prolific writers, who renovate and decorate their homes, who are talented sportspeople, who have beautiful and paradisiacal gardens, who can paint or draw, who can fix machinery or make anything they can imagine, who plan and prepare extensive dinner parties, who can prepare a perfect latte, who can make a divine floral arrangement, who can speak other languages fluently, who commit to further study, who can design memorable posters and documents, who can build their own furniture and who live their passions. I’m most interested in giving things a go, it’s not so much about the quality of what you are doing, but rather that you are actually doing something. Particularly if it is a creative pursuit, there are many benefits to be gained by exercising that part of your brain and it makes life enjoyable. I mean, I like watching television, but I don’t gain any enjoyment out of it. I get enjoyment and satisfaction out of baking, making some little craft, reading, wrapping presents and the like. My dad always says that a man’s got to have a project. This is coming from a man who has many, many projects (both completed, uncompleted and pure ideas) and this from a man who knows how to do lots of things. I agree with him. Having personal projects is productive and enjoyable, it is interesting and most of all, it is a great way to continue learning and growing. So whilst the nineteenth century term of accomplishment has gone out of fashion, it is still very much alive. So don’t be shy, don’t say you don’t have time to follow your creative pursuits. Make the time, try your best and keep learning new techniques and ideas. You never know who out there will admire your efforts. For a little bit of fun, here’s a quiz to find out which Jane Austen heroine you are…. What are your accomplishments (or what you know how to do)? What accomplishments do you wish you had? What a great skill to learn. I have jam-making on my list of someday projects. Just remember the story of the Little Red Hen for when everyone else wants to capitalise on your skills in an apocalypse!